Home > Causes of Hair Loss > What is Trichotillomania? While hair loss can have many natural causes one disease, Trichotillomania, causes sufferers to compulsively pull out their own hair. While this condition results in hair loss it can also lead to other conditions, such as depression. Trichotillomania is a psychological condition that is characterised by the need or overwhelming urge to pull one's own hair out by the root. While this compulsion is more commonly limited to the pulling of hair that is attached at the scalp, some sufferers also tug on and remove the hair from their eyelashes, eyebrows and pubic areas. 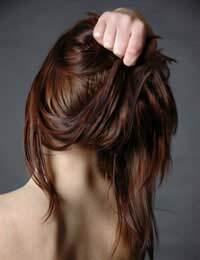 Although many people believe this act of hair pulling to be a habit that the sufferer should be able to stop, it is actually a type of anxiety disorder that compels the patient to continue pulling even when they desperately do not wish to. Scientists and doctors do not know the exact cause of trichotillomania, but they do have a few theories as to how it develops. Some believe that the condition is caused by a disruption or abnormality in the chemicals that are sent between nerve endings in the brain. Others believe that the disease is genetic and brought on by episodes of intense Stress or anxiety. No matter which theory they prefer, all agree on the symptoms of this disorder. Individuals who are suffering from trichotillomania experience an unbearable need to pull their own hair. They sometimes pull individual strands but more often pull out entire clumps at a time, which results in noticeable bald spots on the scalp. These sufferers also experience excessive periods or feelings of tenseness prior to pulling on their hair that are intensified when they try to resist the action. They also experience relief, a feeling of relaxation, or feelings of pleasure as they are pulling on their strands of hair. Although the symptoms of trichotillomania can develop at any age, they are more commonly seen in adolescents. These symptoms are thought to be brought on by extremely stressful events, such as abuse, the death of a family member, problems at school or conflict at home. However, the symptoms can also be triggered by hormonal changes brought on by the onset of puberty. When an individual or a person close to the individual, starts noticing these symptoms and compulsions, it is time to make an appointment with a doctor. Although trichotillomania cannot be cured, it can be treated be treated and controlled. The two main types of trichotillomania treatment include medications and therapy. Since the disorder mirrors many of the symptoms of anxiety disorders and impulse control disorders, the drugs used to control trichotillomania are usually the same. These medications include Anafranil, Depakote, Lithium, Luvox, Paxil, Prozac and Zoloft. Once a doctor has done a full medical history, a complete exam, and a close study of the current symptoms, he will determine which drug offers the most hope and at what dosage that medication should be taken. Along with medication therapy, many doctors recommend that their patients seek behavioural therapy to help them control their hair pulling urges. In this therapy, the counsellor or psychologists will teach the patient to recognise their trichotillomania behaviours, their triggers and their actions of hair pulling. Once a patient becomes aware of the pulling, he is then taught to substitute other, healthier behaviours for the hair pulling. Behavioural therapy is also used to teach patients ways to resist the urges caused by their disorder, ways to defuse the stress and anxiety caused by the disorder, and ways to build self-esteem since trichotillomania can lead to feelings of failure, frustration, embarrassment and reduced self-respect. Although treatment can take time and the road to recovery can be difficult and frustrating, trichotillomania does not have to be a debilitating disease. With the right medication, therapy and support this disorder can be conquered and controlled. For more information on this condition, read our article Coping With Trichotillomania on this site.